Non Member full price. Become a member and receive special pricing for all events! California is the most populous state in the nation, with more than 39 million people. Of that 39 million, 32% are Protestants, 28% Catholic, 3.2% Jewish, 1% Muslim. Other religions prevalent in California include Buddhism, Shinto, Sikhism, Hinduism, and Taoism that became part of California thanks to the Asian emigrants who constitute a sizeable percentage of the population. California is also home to the 2nd largest number of Mormons after the state of Utah. At some point in your work as a therapist, you will encounter client’s who bring their religious and spiritual beliefs into the therapeutic process. Whether or not you consider yourself to be religious or spiritual, it is essential that you be skilled in fostering supportive discussion of how a client’s beliefs inform & guide their therapeutic process. It is often the case that we serve clients who, as a consequence of loss or trauma, have lost faith in their religious or spiritual beliefs. They may be disillusioned and feeling lost. As therapists we have a vital role to play in helping client’s to explore their spiritual beliefs & crises while helping them navigate to a secure foothold to move from. This training will provide a means for you to explore this important area of inquiry with your clients so that can you can foster their ongoing recovery & growth throughout their therapeutic process. 2. Participants will learn how to recognize & attend to client’s spiritual crisis or loss of faith in the service of fostering improved therapeutic outcomes. 3. Participants will expand their awareness of how to include religion / spirituality as a therapeutic intervention. David Kim received his Bachelor of Arts in Political Theory from Stanford University and his Juris Doctorate from the University of Hawaii’s William S. Richardson School of Law. Dave is also a Certified Mediator and has served as a Minister full-time for the past 23 years. Robyn received her Masters of Science in Counseling from Cal State University Long Beach. Robyn worked as a School Based Therapist working with diverse families in crisis for the nationally recognized mental health treatment agency, Shields For Families. Robyn has extensive experience working with community-based outreach programs for individuals, couples and families. Robyn has a wealth of experience working clinically with children, couples and families. Her areas of expertise include play therapy, trauma processing, pre-marital counseling and multi-cultural counseling. Robyn has successful private practices in both Torrance & San Pedro, California. 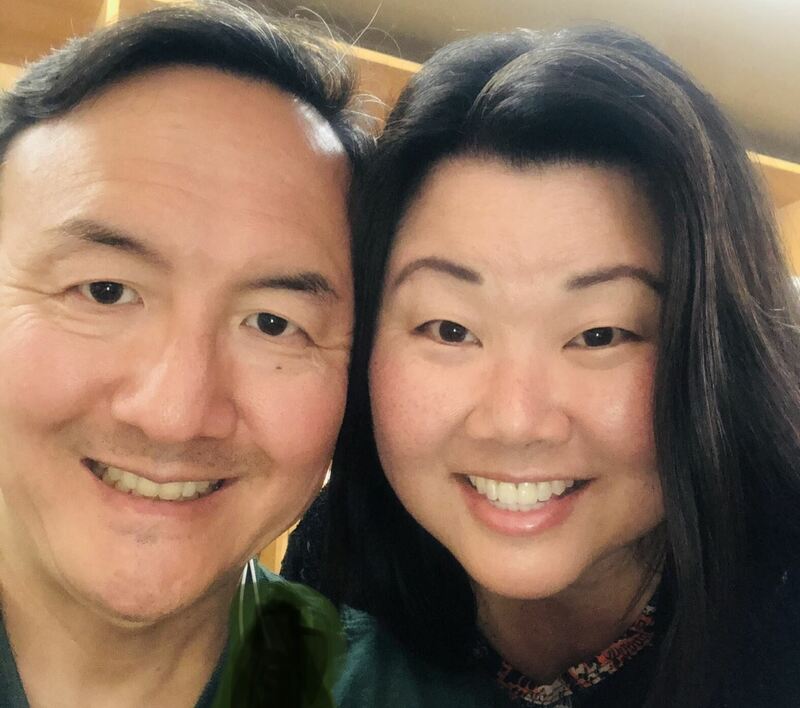 David and Robyn have led widely diverse congregations of over 400 members in both Hawaii & California. They have worked spiritually & clinically with members who have many different issues of faith and trauma with the goal of helping them to find empowerment and connection in their faith. David Kim, JD and Robyn Murakami Kim, LMFT were married 23 years ago in Hawaii and have a daughter in college and a son in middle school. Meetings are now FREE for members who pre-register! Participants will receive 2 CEUs upon completion of this event. The informal networking is not part of the CEU portion of the program. Participants and speakers may remain for questions if they wish or can simply network without any structure. You most certainly may announce that you are willing to stay during that time slot to address any questions. Long Beach - South Bay CAMFT - APPROVAL NUMBER: PCE 3803 Course meets the qualifications for two (2) hours of continuing educationfor LMFTs, LCSWs, LPCCs and/or LEPs, as required by the California Board of Behavioral Sciences. Refund Policy: With a 24-hour written notice, a full refund will be provided. With less than 24 hours' notice, credit towards attendance at a future education program course will be provided. Target Audience: This educational program is planned for marriage and family therapists, marriage and family therapy interns, social workers, counselors and/or educations psychologist. Special Needs Accommodations: In the event that special needs accommodations are required, please contact Sara Burchfiel at saraburchfielmft@gmail.com indicating your need at least one week prior to the educational program. Awarding Course Completion Certifications: LB-SB CAMFT monitors attendance with sign-in and sign-out sheets and final course evaluations. Once the participate have signed out and provided course evaluations, course completion certificates will be provided. Grievances: The Program Administrator (PA) and Board of Directors (BOD) will handle complaints or grievances and conduct investigations to determine the appropriate resolutions. The BOD and PA will respond within 48 hours of receiving the complaint and will provide timely fall-up to the participant during the course of investigation and resolution.